I am a Star Wars fan so this story adds to the whole picture that was started over thirty years ago. Don't hope for the best lines in this one, just remember that it is a character background story and introduces us to the evolution of Darth Vader. Aside from that, some great light-saber and jedi action scenes were made as well as new aliens and armies of clones and droids that battle for control of the empire. The Anakin and Jar Jar characters are a little hokey at times, but the kids still like them. If you are a Star Wars "dork" like me, you can enjoy this one for filling in the blanks. But if you are a movie buff looking for "Oscar" material, you will probably be disappointed. The first of three prequels to George Lucas’s celebrated STAR WARS films, EPISODE I: THE PHANTOM MENACE is set some 30 years before the original STAR WARS EPISODE IV: A NEW HOPE in the era of the Republic. Naboo, a peaceful planet governed by the young but wise Queen Amidala (Natalie Portman), is being threatened by the corrupt Trade Federation, puppets of an evil Sith lord and his terrifying apprentice, Darth Maul (Ray Park). Jedi knights Qui-Gon Jinn (Liam Neeson) and Obi-Wan Kenobi (Ewan McGregor, performing an amazing vocal imitation of Alec Guinness, the older Obi-Wan) are called on to intervene in the trade disputes. Along the way, they acquire an apprentice of their own in the form of young prodigy Anakin Skywalker (Jake Lloyd), or as STAR WARS fans know him, the future Darth Vader. They also encounter Jar Jar Binks (Ahmed Best), a goofy, lizardlike creature who has been banished from his underwater world for clumsiness. 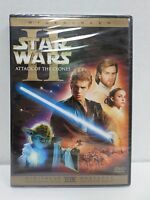 When the Trade Federation launches an attack on Naboo, the queen and her allies must battle hordes of robot troopers while Qui-Gon and Obi-Wan face off against the sinister Darth Maul. One of the most anticipated films of all time, THE PHANTOM MENACE sets the stage for the tumultuous events to come. Lucas fills the screen with detailed sci-fi creatures and locations, revealing the most creative and exquisite sets, costumes, and character designs to hit the screen since the original trilogy. It's Star Wars, that makes it special.